You don’t have a present yet and you would like to make an enthusiastic runner happy? Then you can give him a voucher for the Muttenz Marathon. Of course you can also get vouchers for the other distances like the half marathon or the 10 km spring run. Fill out the contact form completely and accept the order conditions. Then press submit and your selected voucher will be sent to you online within the next 1-2 days by email. 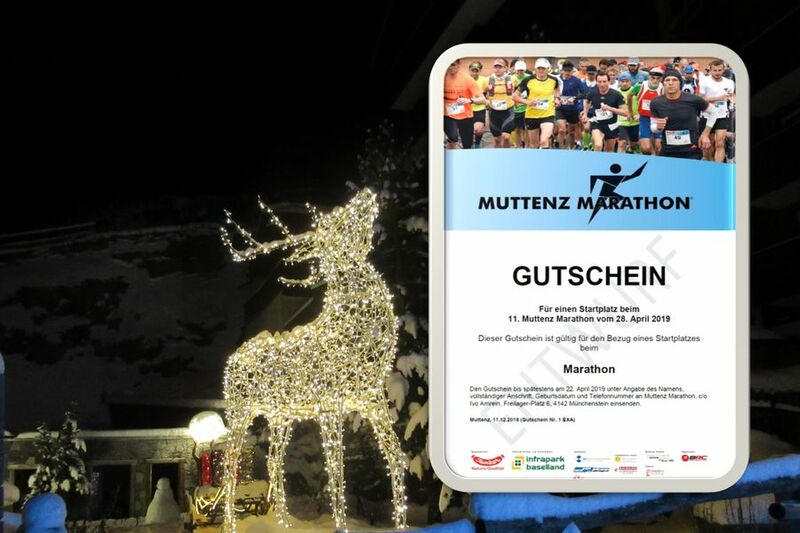 The voucher is transferable and must be sent to Muttenz Marathon, c/o Ivo Amrein, Freilager-Platz 6, 4142 Münchenstein by 22 April 2019 at the latest, including the name, full address, date of birth and telephone number of the runner. The individual voucher code printed on the voucher is not valid until the entry fee has been paid in full. The account details for the transfer of the entry fee will be sent to the ordering party by email when the online voucher is delivered. Please indicate the voucher code as remark when making the money transfer.